March is Extension Month in Tennessee. Extension is a national educational program supported by USDA through the nation’s land-grant universities and administered with funding from state and local governments. In Tennessee there are Extension offices in each of the 95 counties, and the UT-TSU Extension Office in Lawrence County invites everyone to join their local celebration. An integral part of the land-grant mission, Extension programs are delivered by subject-matter specialists, county agents and volunteers associated with the University of Tennessee Institute of Agriculture (UTIA) and the Tennessee State University (TSU) College of Agriculture, Human and Natural Sciences. “Extension Month celebrates the educational outreach, service and economic impact achieved by Extension across the state. I am always encouraged and proud to hear how our county offices use this month to reach new clientele and increase the visibility of Extension,” wrote Robert Burns, dean of UT Extension, in a letter to faculty and staff. Latif Lighari oversees TSU Extension faculty as associate dean for Extension at TSU. In addition to the traditional agricultural production recommendations available through county Extension offices, services for all citizens include the state’s award-winning 4-H youth development program including its summer youth camps; family and consumer educational programs; and healthy living courses. The increasingly popular courses for Master Gardeners and gardeners in general, are also conducted through county Extension offices. UT Extension also performs services for the state’s citizens, including managing the statewide Soil, Plant and Pest Center through which clients can have the quality of their soil and forage analyzed and any insect pest or plant diseases identified. Extension also trains clients in the proper use of pesticides and even operates commercially-certified kitchens where small-scale vendors can prepare food items for sale while meeting state guidelines for food safety. Extension’s programs can be seen in Tennessee as an excellent investment of public resources. The statewide educational programs in 4-H youth development, agriculture and natural resources, family and consumer sciences and community economic development are estimated to have impacted the state’s economy by more than $575 million from July 1, 2017, through June 30, 2018. Contact the Lawrence County Extension Office for more information. You can find contact information on line at: https://extension.tennessee.edu/Lawrence/Pages/default.aspx. Follow the Lawrence County Extension Office on Twitter at: UT-TSU ExtLawCoTn and find us on Facebook at: UT-TSU Extension-Lawrence County. Many of UT Extension’s educational resources are also available online. From the UT Extension website choose the link to “publications” and enter the topic for which you need. The field day will be held at the Gary Daniel Farm (199 Gary Daniel Ln, Cypress Inn, TN). Lunch will be provided. This field day is free and open to anyone who wants to learn more about cattle. Low Stress Cattle Handling—Kevin Thompson, Director of the Middle TN Research & Education Center, will demonstrate cattle handling on horseback. A.I. Demonstration — Select Sires will be on hand with their A.I. Breeding box to demonstrate Artificial Insemination. UT-TSU Extension Offices in Lower Middle Tennessee have teamed up to offer a Basic Beef Management Series to be held on 4 consecutive Tuesday nights beginning on March 12th and ending on April 2nd. The classes will begin each evening with a light meal and the program following at 6pm. The classes will rotate from Columbia to Lewisburg to Lawrenceburg to Pulaski. This program is geared toward beginning beef cattle producers or those pondering getting into the beef cattle business and will be very similar to the Original Master Beef Producer Class. There will be no cost to attend except for those who would like to become certified as Master Beef Producers. To achieve the Master Beef Certification, producers will be charged (either $100 with a BQA Certification or $200 without BQA Certification) and be required to attend all of the classes. Members of the Lawrence/Wayne County Cattlemen's Association and their families gathered on January 19th for their annual meeting. The members and their families were treated to a wonderful meal of roast beef and all the trimming prepared by the Lawrence County High School Cafeteria Staff. Sponsors of the meal include, Bank of Waynesboro, Wayne County Bank, Peoples Bank, Bank of Frankewing and Farm Credit Services. Approximately 220 people were in attendance to hear important issues affecting the cattle industry. 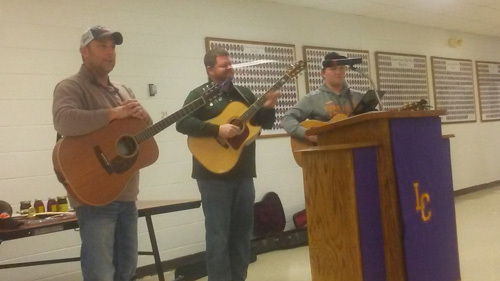 Pork and Beans entertained the group with their songs and stories about farming and agriculture. Don Lampley with the Tennessee Department of Agriculture gave an update on TAEP and Extension Agents, Calvin Bryant, James Harlan and Matt Adams then provided updates on Extension Programs and 4-H Youth Livestock Projects. 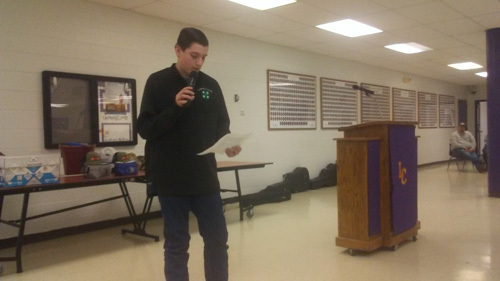 Lawrence County 4-H Livestock member, Jansen Robbins spoke on his experiences as a livestock exhibitor and thanked the members for their support and sponsorship of Lawrence & Wayne County 4-H Livestock Clubs. assisting with the Lawrenceburg Bull Test since 2010 performing BSE Tests on over 450 bulls at a very affordable rate. In a time when Large Animal Veterinarians are becoming less and less, Dr. Hill exemplifies a true Cattlemen’s Veterinarian. Another highlight of the evening is when the youth scholarship winners are announced. Each year the Lawrence/Wayne County Cattlemen’s Association awards scholarships to children or grandchildren of members who are in college or plan to attend college and major in agriculture or related field. 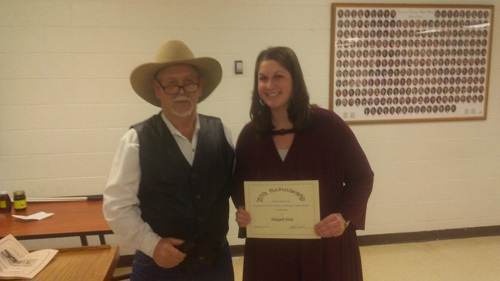 The 2019 winners of the Lawrence/Wayne County Cattlemen's Association Scholarship were announced with the awards going to Abigail Dial and Katelyn Gambel. Abigail is the daughter of Melissa and John Dial of Cypress Inn. Abigail is a 2018 graduate of Collinwood High School and she is current attending UT Martin at the Parsons Campus where she is majoring in nursing. Katelyn is the daughter of Marty and Amanda Gambel of Loretto. She is a senior at Loretto High School where she has been very active in many school organizations. The 2018 scholarships winner, Jordon Wilburn was presented his scholarship. Jordan is attending UT Martin where he is a sophomore majoring in Animal Science. The meeting concluded with the presentation of door prizes and the election of the 2019 board members. Lawrence/Wayne County Board Member Kenny Springer presenting the 2019 Cattlemen of the Year to Dr. Gary Hill. Lawrence/Wayne County Board Member Kenny Springer presenting the 2019 scholarship to Abigail Dial. Lawrence/Wayne County Board Member Kenny Springer presenting the 2019 scholarship to Katelyn Gambel. Lawrence County 4-H Livestock Club Member Jansen Robbins thanking discussing his 4-H Livestock Project Work. “Pork and Beans” entertaining the audience. Pictured left to right –Brandon Whitt, Josh Ogle and Levi Ogle. To assist those who would like to complete the Advanced Master Beef Producer Program, UT Extension has scheduled a class for January. The class is a daytime class that will meet from 8am.–2:30pm on three consecutive Wednesdays starting on Jan. 16th and concluding on Wednesday, January 30th. The cost of the class is $100 with a current BQA number. Premise ID’s are no longer required. There will be 2 other Advanced Master Beef Producer Classes in October. The second class will be held in October on Thursday nights (Oct. 3rd, 10th, 17th & 24th) from 6pm-9pm. The third class will be held in conjunction with the Giles County Beef Festival and be held on Thursday night Oct. 3rd and all day and Friday, Oct. 4th and Saturday, Oct. 5th. A more specific schedule of these classes will be made at a later time. The Advanced Master Beef Producer Class will also be available to producers who have never completed the Original Master Beef Producer Class. This will suffice for their TAEP requirements and these producers will be given added resource materials that graduates of the Original Master Beef Producer Classes have already received. To register or for more questions contact the Lawrence County Extension Office at 762-5506. The Lawrence/Wayne County Cattlemen’s Association Annual Meeting has been scheduled for Saturday, January 19th 5:30pm at the Lawrence County High School Cafeteria. Members and guest will be treated this year to a fun and entertaining program featuring “Pork and Beans”. Pork and Beans is an entertainment duo dedicated to sharing their story of Agriculture in a positive light through music and song. The business part of the meeting will consist of the announcement of the 2019 scholarship winner(s) and the presentation of the 2018 scholarships. The highlight of the evening will be the announcement of the 2019 Cattlemen of the Year. Reservations need to be made before Thursday, January 17th, by calling either the Lawrence County Extension Office at 762-5506 or the Wayne County Extension Office at 722-3229. You can also email me at ibryant1@utk.edu. It is extremely important to call in your reservation to insure we have enough food for everyone in attendance. The 2019 Tennessee Cattlemen's Association Convention and Trade Show is January 25th & 26th at Embassy Suites in Murfreesboro, TN. Join nearly 1,000 other cattle producers at the 34th Annual Tennessee Cattlemen's Association's Convention and Trade Show. You'll hear from the industry's leading experts and will learn about new products available to make your business successful. Also, you'll have an opportunity to make new friends and have a great time! The University of Tennessee Senior Bull Test Station Sale will be held Friday, January 25th beginning at 11am at the Middle Tennessee AgResearch and Education Center in Spring Hill. This date is a slight change from the normal Thursday sale day and held in conjunction with the TCA Annual Meeting. The sale will be Tele-Videoed at the convention. Check the following web-site for more information on each bull. UT Extension Forage Weed Control Specialist Dr. Neil Rhodes will highlight a Forage Weed Control Meeting on Tuesday, February 26th beginning at 11am and concluding with a sponsored lunch. RSVP to the Extension Office at 762-5506. There will be a BQA Training opportunity after the Forage Weed Control meeting that will begin at 1pm. At the conclusion of the Forage Weed Control Meeting there will be a BQA Training offered that will begin around 1pm. BQA Certifications are good for 3 years and producers must have a current certification at time of TAEP application in October to be eligible to apply for the grants. UT Extension in Giles, Lawrence and Maury Counties are teaming up once again to offer an Advanced Master Beef Producer Class. The class will meet from 8am.–2:30pm on three consecutive Wednesdays starting on Jan. 16th and concluding on Wednesday, January 30th. The cost of the class is $100 with a current BQA number. The class location will rotate from Spring Hill to Lawrenceburg to Pulaski in that order. Advanced Master Beef Certifications are good for 4 years according to requirements for the master level of the TAEP by the Tennessee Department of Agriculture. 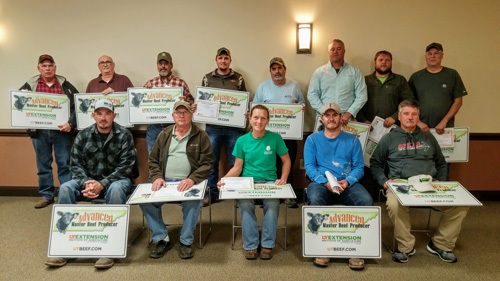 There are approximately 70 Lawrence County Beef Producers whose Advanced Master Beef Certifications will be expiring sometime in 2019. The Advanced Master Beef Producer Class will also be available to producers who have never completed either the first Advanced Master Beef Producer Class or the Original Master Beef Producer Class. Added resources will be given to first time participants. To register or for more questions contact the Lawrence County Extension Office at 762-5506. Now that summer has officially arrived, everyone will start to focus on all the chores that have to be done to “gear” up for the upcoming season, including fly control. Fly’s reduces performance and the economic loss from each horn fly biting an animal 30 times/day can also be substantial. Certain flies are responsible for spreading diseases such as pink eye and potentially Anaplasmosis and or Bovine Leukosis, so to decrease disease risk to your livestock here are a few tips to reduce the flies’ impact on your farm’s production. 1. Feed a larvicide or an insect growth regulator early in the season starting 30 days before flies typically emerge. Continue to feed until 30 days after a killing frost. 2. Pour-ons. During spring turnout time, you can use a product that is labeled to control internal parasites, as these products also have efficacy against horn flies. Later in the year, use products only labeled for flies and/or lice. Using pour-on dewormers multiple times throughout the year could lead to internal parasite resistance issues. 3. Dust bags/cattle rubs. The advantage of a dust bag or rub is that, if placed at a site where all cattle must use it (watering trough, mineral lick), it can provide economical control of face and horn flies. Proper placement and keeping it charged with insecticide are the keys. Also, strips that can be mounted to mineral feeders can also be an efficient way to apply insecticide to the face of cattle. 4. Topical sprays. Timely application of fly sprays or paint ball style packets throughout the year can be effective in reducing the fly population, but can be time-consuming if cattle are grazing an extensive area. 5. Fly tags. The key to using tags is to wait until you have 200 flies/cow to place the tags. If applied too early, there will be decreased efficiency. Use pyrethroid tags for two consecutive years, then switch to an organophosphate tag for one year to reduce pyrethroid resistance. Also, there are new generation fly tags that contain different insecticides and are quite helpful in quite helpful in controlling fly populations. Always follow label directions on the number of tags/cow. Be sure to remove tags at the end of the season to prevent resistance problems. 6. Don’t mix classes of chemicals in the pour-ons, topicals, and fly tags within the same year. Use the same class 1-2 years, then rotate. 7. Fly predators. Not all flies are bad. Fly predators, nature’s own self-inflicted enemy, can be your ally in the fight against pest flies. These are tiny, non-stinging, non-biting wasps that feed on fly larvae and interrupt the breeding cycle of flies, destroying the next generation of flies before they hatch into disease-carrying adults. These predators can be used in areas where cattle tend to congregate and manure tends to accumulate, just apply the predators to manure piles in these areas. Replenish your fly predator supply once a month from April to September; otherwise the fly life cycle will only be broken for a few weeks. A multifaceted approach is best for attaining your goal of “controlling” flies, so using just one strategy from the above list probably won’t give you the results you anticipate. Like the state of Tennessee, Lawrence County’s number one economic enterprise is agriculture. According to the 2012 Agriculture Census there were 1559 farms that produced over 65 million dollars of farm products in Lawrence County in 2012. To many agriculture is not only a source of income but a lifestyle. Our very first President of the United States, George Washington said this, “Agriculture is the most healthful, most useful and most noble employment of man”. Lawrence County farmers are challenged daily with decisions on how to best raise their livestock and crops. They are always looking for the most economical strategies, but they are also very aware of the importance of making sustainable and environmentally friendly decisions. One decision that has to be made is when a pesticide has to be used. New technologies have provided more options for farmers and in most cases these new technologies have decreased the use of pesticides and made them safer to the environment. Farmers are very conscientious each and every time a pesticide is selected and applied. A pesticide is defined as a substance used to control pests. There are many potential pest that can cause problems on crops and livestock. Herbicides control weeds, insecticides control insects, fungicides control fungus and diseases and the list goes on. Farmers are not the only group that use pesticides. Home owners, gardeners, utility companies, landscapers, parks, golf courses, and sports field managers commonly use pesticides to help manage pests. Pesticides are closely monitored and regulated by multiple governmental groups. In Tennessee pesticides that are legal to use and sold are divided into General-Use Pesticides and Restricted-Use Pesticides. General-Use Pesticides are labeled and offered for sale to the general public. Restricted-Use Pesticides are labeled and available only to Certified Applicators. A certified applicator can either be a commercial or a private applicator. Both of these groups are required to complete extensive training on pesticide safety on a regular basis. The ultimate governing body of pesticides is the label. Following the label is the law of the land whether you are spraying your garden tomatoes, your golf course, your field of hay or a crop duster plane making an aerial application of fungicides over a field of soybeans. Lawrence County is home to over 43,000 citizens. Most Lawrence Countians are not farmers and do not live on a farm. In general the average person has very little knowledge of agriculture. Proper education of farming and agriculture is extremely important. There are numerous sources of information that provide unreliable, misleading and ultimately incorrect information. Be cautious of these sources and seek out sources/facts that are non-biased as well as researched and science based. For those that live near farms where pesticides are applied be neighborly and communicate to the farmer if you have a concern. In most cases the farmer will be happy to visit with you about your concerns. Although it is not legally required, most farmers will provide neighbors with when and what they will be spraying. Just as the farmers have the right to apply pesticides on their property and crops, neighboring owners have the right to not have pesticides drift onto their property. Neighbors working together with farmers and forming open lines of communication will help educate and inform all parties involved. Many pesticides are labeled to be both ground and aerial applied. Because there is more chance of off target incidences with aerial application fewer pesticides are labels to be applied with this method. Use of crop duster planes or helicopters to apply pesticides is legal as long as the pesticide label allows for aerial application. Extreme caution is always used when applying pesticides from an aircraft. Crop duster planes are also commonly used to spread seeds for cover crops and in many cases that is what is being applied instead of pesticides. In the rare case that there is a possibility of off target drift from a pesticide application the correct procedure to report that issue is to contact the Tennessee Department of Agriculture. They are the point agency to contact to report pesticide issues and not the local sheriff or police departments. The phone number to call to report a pesticide issue is—1-800-628-2631, not local emergency dispatch. The Tennessee Department of Agriculture can involve local law enforcement if state laws have been broken. The law regarding applying pesticides in Tennessee can be found at the following web-site: https://law.justia.com/codes/tennessee/2010/title-62/chapter-21/part-1/62-21-118/. For more information on pesticides and pesticide safety contact the Lawrence County Extension Office at 762-5506 or email ibryant1@utk.edu. Members of the Lawrence/Wayne County Cattlemen's Association and their families gathered on January 27th for their annual meeting. 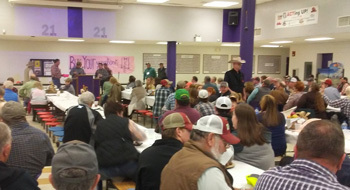 The members and their families were treated to a wonderful meal of roast beef and all the trimming prepared by the Lawrence County High School Cafeteria Staff. Sponsors of the meal include, Bank of Waynesboro, Wayne County Bank, Peoples Bank and Farm Credit Services. Approximately 230 people were in attendance to hear important issues affecting the cattle industry. The Lawrence County High School FFA Chapter conducted a silent auction from items they received from TSC. Tennessee Assistant Commissioner of Agriculture, Keith Harrison spoke to the group about the Consumer and Industry Services Division of the Tennessee Department of Agriculture. Cowboy Dan then took to the stage and entertained the group with his songs and stories about agriculture. Extension Agents, Calvin Bryant, James Harlan and Matt Adams then provided updates on TAEP, Extension Programs and 4-H Youth Livestock Projects. 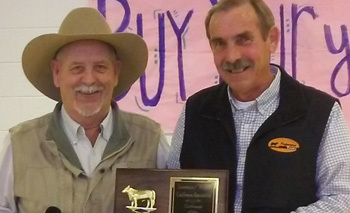 Each year the highlight of the evening is when the association recognizes a "Cattlemen of the Year". 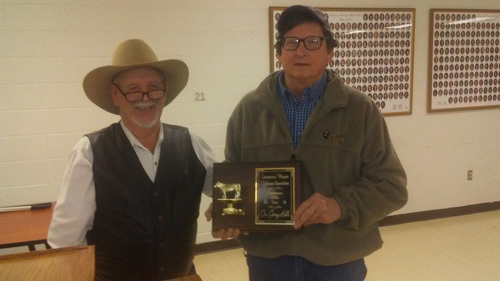 This year the board decided to present this recognition to longtime Wayne County Beef Producer Kenny Kelly. Kenny has been an Angus Breeder for many years and has become recognized as one of the premier Angus Breeders in the state. Kenny routinely enters bulls in the UT Extension Bull Test and markets bulls all over Tennessee and the Southeastern United States. Kenny joins his father C.F. Kelly on the list of past Lawrence/Wayne County Cattlemen of the Year making them the first father/son duo to earn this recognition. Another highlight of the evening is when the youth scholarship winners are announced. 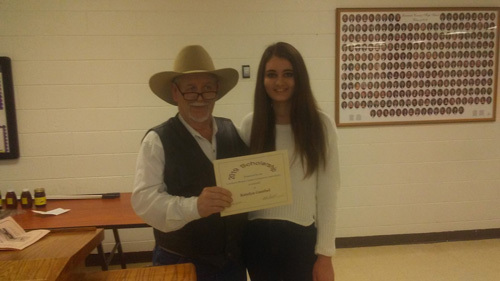 Each year the Lawrence/Wayne County Cattlemen’s Association awards scholarships to children or grandchildren of members who plan to attend college and major in agriculture or related field. 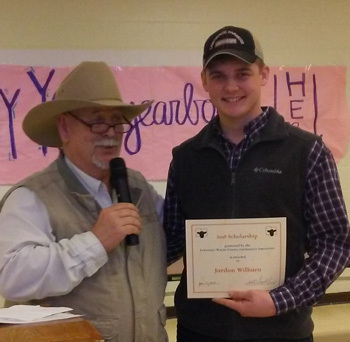 The 2018 winner of the Lawrence/Wayne County Cattlemen's Association Scholarship was announced with the award going to Jordon Wilburn. Jordon is a freshman at UT Martin where he is majoring in Pre-Vet. The 2017 scholarships winners, John Calvin Bryant and Alaina Staggs were presented their scholarships. John Calvin is a sophomore Food Science Major at UT and Alaina is a freshman Animal Science Major at UT. The Lower Middle Tennessee Cattlemen’s Association has teamed-up with the Tennessee Livestock Producers, UT Extension and Boehringer Ingelheim to offer a Stocker Educational Workshop. The workshop will take place on Friday, March 9th at the Tennessee Farm Bureau Headquarters in Columbia. The workshop will be held in conjunction with the monthly Lower Middle Tennessee Cattlemen’s Association Video Board Sale. The Video Board Sale begins at 9am and the workshop will immediately follow. Chris Swift with Swift Trading Company, who does a daily commentary called “Shootin The Bull” will discuss the cattle market and risk management strategies. Dr. Mark Turney, a Houston County Veterinarian who routinely works with stockers will cover health issues and UT Extension Farm Management Specialist, Kevin Ferguson will explore budgets for stocker producers. Attached is a flyer with more specific information on the workshop. To register please call Diane at the TLP Office at 931-388-7872, Option 1, Extension 2235. Producers who plan to apply low--volatile versions of dicamba herbicide to a crop in 2018 must attend a UT Extension dicamba specific stewardship training. This dicamba stewardship training fulfils a portion of the federal and state requirements to apply XtendiMax, Engenia, and FeXapan. Producers must have a valid dicamba certification card to apply these pesticides in Tennessee. The cost of the training will be $25. The trainings will cover best management practices for all 3 of the low—volatile versions of dicamba. To assist producers needing to complete this training we have scheduled 2 training opportunities. UT Extension Crop Weed Spec. UT Extension Grain Marketing Spec. Commercial Pesticide Points will also be available. To register for this training contact the Lawrence County Extension Office at 762-5506 or email ibryant1@utk.edu. UT Extension Livestock Marketing Spec. *** The Private Certification Training will be offered at the conclusion of the Dicamba Training. This is an Initial Certification Training for those that are not currently certified. The training last 3 hours and the cost to become certified is $75. To purchase the low-volatile versions of dicamba, producers must be a certified private applicator. To apply the low-volatile versions of dicamba, producer must have both certifications. UT Extension in Giles, Lawrence and Maury Counties are teaming up once again to offer an Advanced Master Beef Producer Class. The class will meet from 8am.–2:30pm on three consecutive Wednesdays starting on Jan. 17th and concluding on Wednesday, January 31st. The cost of the class is $100 with a current BQA number. The class location will rotate from Columbia to Pulaski to Lawrenceburg in that order. Advanced Master Beef Certifications are good for 3 years according to requirements for the master level of the TAEP by the Tennessee Department of Agriculture. There are approximately 100 Lawrence County Beef Producers whose Advanced Master Beef Certifications will be expiring sometime in 2018. 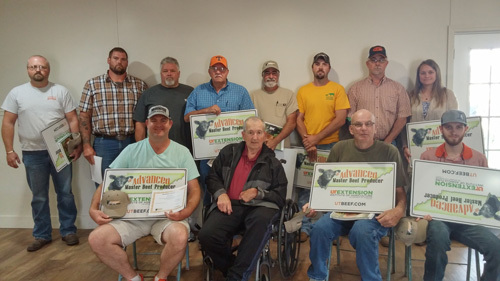 The Advanced Master Beef Producer Class will also be available to producers who have never completed either the first Advanced Master Beef Producer Class or the Original Master Beef Producer Class. Added resources will be given to first time participants. To register or for more questions contact the Lawrence County Extension Office at 762-5506. Photo 1---Advanced Master Beef Producer Oct. Class 1 2017 Lawrence County Graduates. Pictured left to right: Michael Miller, Gary David Smith, Tim Springer, Hank Brewer, Michael Marks, Johnny Whiten, Jamey Crews, Larry Brown, Hoyt Tidwell, Don Baldwin, Barry Doss, Troy Kelsey Jr., and Phillip Gibbons. Not pictured Lowell Stafford and Tammy Stafford. Photo 2--- Advanced Master Beef Producer Oct. Class 2 2017 Lawrence County Graduates. Pictured left to right: Talmadge Roper, Ronnie Moore, Charles Robertson, Sabetha Pigg, Grace Kelly, Patrick Kelly, Roy Hagan, Gary Fox, Candace Bedford, Les Grooms, Steve Sutherland, and Milton Williams. With the arrival of the cooler temperatures that come with the changing of the seasons some insects start looking for warmer places to spend the winter. One of the most common insect invaders is the Multicolored Asian lady beetle. These beetles are orange-red with a variable number of spots and sometimes they are referred to as “Halloween Beetles”. These beetles may congregate on the sunny sides of buildings by the thousands and, if given the opportunity, will often move inside in search of an overwintering site. In Japan, they seek protected sites such as cracks and crevices in rocks on mountains. In the U.S., they use buildings as overwintering sites. This can be a particular problem in log homes because of their many cracks and crevices. These Multicolored Asian lady beetles were first introduced into the United States to control aphids and because of this they are generally considered to be a beneficial insect. These beetles do not sting, do not carry diseases and do not consume or excavate wood. However these same friendly bugs, when inside a home can stain wallpaper and upholstery yellow when crushed. When the multicolored Asian lady beetle is present in large numbers, some individuals with insect allergies have been irritated. What attracts these insects to your home? The beetles seem to be attracted to light-colored walls, but this is not always the case. Dark-colored buildings are still invaded. Large windows or other reflective surfaces may also attract them. What can be done to prevent this beetle from entering your home? Exclude them! Don’t give them the chance to enter! Exclusion practices should be performed each year with the arrival of autumn. The first step to prevent entry into a home is to seal cracks and crevices where insects may enter the structure. Once the beetles have found a crack and crevice to over-winter, they may remain inactive on cool days. On warm days when the sun is shining, activity is often seen on the western or southern side of the house. Take notice of the direction from which the beetles are coming and try to locate their resting spot. Locate this resting spot on a cool day, when the beetles will be clustered and can easily be removed with a vacuum. Unfortunately, these resting spots may be in wall voids or other inaccessible spaces. For more information about what can be done to prevent this beetle from entering your home, contact UT Extension Lawrence County by calling (931) 762-5506. The state veterinarian has announced three new cases of horses sickened by viruses that infect the blood. A horse in Davidson County and a horse in Knox County recently tested positive for West Nile Virus (WNV). A horse in Bedford County tested positive for equine infectious anemia (EIA). Sick horses cannot directly infect people with WNV or EIA. For WNV, mosquitoes and other biting insects are responsible for transmission. Symptoms in horses may include fever, weakness, loss of appetite, or convulsions. The illness is treatable and the WNV vaccine for equines is particularly effective. EIA is commonly transmitted through biting insects or sharing needles. Symptoms in horses may include fever, weakness, swelling, loss of appetite, or colic. However, an infected horse may not show any clinical signs. There is no treatment or vaccine. Once infected, a horse must be permanently quarantined or euthanized. State law requires an annual Coggins test to check for the presence of EIA before any horse is transported from its home farm to a different location. Dr. Hatcher advises horse owners to consult with their veterinarians to establish a schedule for vaccines and Coggins tests. Avoid co-mingling your horses with other, unfamiliar horses. Never share needles, dental, or surgical equipment among different animals. Eliminate standing water sources where insects may gather and breed. Apply fly sprays and insect repellants as needed. The C. E. Kord Animal Health Diagnostic Laboratory now offers a full line of equine disease testing, including WNV, EIA, equine herpes virus (EHV), equine protozoal myeloencephalitis (EPM), eastern equine encephalitis (EEE), and equine influenza virus (EIV). Contact your veterinarian for more information. The will be 2 opportunities for producers to complete the Advanced Master Beef Producer Class this fall. The first 3 Thursday nights there will be 2 speakers covering 2 topics and the last Thursday night will be 1 speaker and 1 topic with graduation to follow. An Advanced Small Ruminant Producer Class has been scheduled for Oct. 25-27th at the Middle Tennessee Research and Education Center in Spring Hill. The class will begin each day at 9am and conclude around 4pm. Specific speakers and topics are currently being scheduled. The cost of the class will be $100. For more information contact the Lawrence County Extension Office. All Private Applicator Certification Cards will be expiring on October 21st 2017. To become recertified, producers must attend a Certified Private Applicator Training before October 21st of this year. A schedule of these trainings is listed on the back page. These training will be the last opportunity private applicators will have to get recertified before the October deadline! The recertification training will last approximately 1.5 hour and consist of a pre & post-test along with watching a pesticide safety training module that will last for 1 hour. The cost to become recertified will be $25. This certification period will be good until June 30th 2020. A Certified Private Applicator is someone who can legally purchase and apply “Restricted Use Chemicals” for use on their own farm. Anyone applying dicamba products must be certified as a private applicator or licensed as a pest control operator in the category of Agricultural Pest Control (AGE), and is required to keep records for such applications. The use of older formulations of dicamba products for the remainder of this agricultural growing season is prohibited. To minimize the potential for off-target movement of the product due to temperature inversion, dicamba may only be applied from 9 a.m. to 4 p.m. in the respective time zone for the location of application. Applying dicamba over the top of cotton after first bloom is prohibited. “I can’t keep dicamba in the field” has been a frequent comment I have heard from many frustrated folks who have followed the rules and tried their best not to drift on their neighbors. Quite a few good and conscientious farmers have thrown up their hands and gone back to Flexstar to try to control pigweed in soybean. Others have reported that they often have been successful not drifting onto non-target areas. However, judging by all the off-target dicamba injury that seems to be more the exception than the rule. So what are the reasons for all the drift? After visiting hundreds of dicamba-drifted RR, LL and conventional soybean fields that easily have totaled over 30,000 acres, I can say with certainty that many of the reasons I have heard recently from upper management in Monsanto are NOT the cause of all these dicamba injured broadleaf plants across west Tennessee. 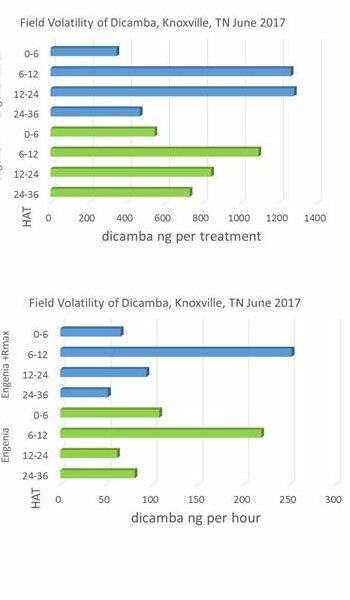 I cannot imagine the hundreds of thousands of acres of non dicamba tolerant (DT) soybeans in Tennessee that have shown dicamba injury could be due to contamination of Liberty jugs with dicamba, calcium deficiency, Dual Magnum burn, and/or surfactant burn. Nor do any of those reasons explain the dicamba injury I have seen in a vineyard, gardens, trees in parks and back yards…….even my backyard. We do not need speculative reasons to explain all the drift issues as there are plenty of real reasons. Firstly, though it looks straight forward on paper, it is extremely hard to follow the label. The best example of this is that you cannot spray when the wind is above 10 mph or below 3 mph. Just that stipulation when you have crops to spray timely in three different counties makes the logistics a nightmare. Another reason, which I believe could be the main reason, is dicamba’s inherent volatile nature. Dicamba is unique compared to most pesticides in that it is prone to “picking back up” as a gas and departing a field hours after application when temperatures are warm. This is particularly true for the older Banvel and Clarity formulations. There is some evidence that older formulations have been used in Xtend crops which would certainly contribute to the off-target movement. Exactly how much of this is going on is difficult to figure. However, it is hard to believe that old dicamba formulations can possibly explain all of the hundreds of thousands of acres of dicamba injured soybean in this state. Could Engenia or Xtendimax be volatilizing as well? My colleague, Dr. Tom Mueller, was asked by members of the Tennessee Soybean Promotion Board to test if there was a difference with Engenia volatility if it was tankmixed with Roundup PowerMax. In the attached figures below showing Dr. Mueller’s research data, please note the data is presented in time intervals following the herbicide application to an acre of soybean. It is presented from 0–6, 6-12, 12-24 and 24 -36 hours after application. Dr. Mueller has said that some of the detection from the first 6 hours could in part be small spray droplets still in the air caught in an inversion which dissipated as the morning warmed up. However, after that 0-6 hour time frame any detection the next 24 hours would be exclusively from volatility. In short, his data shows that Engenia does volatilize and could depart from the field, albeit at extremely small amounts, many hours after application. It also suggests that Roundup PM does not affect the volatility profile of Engenia to any great extent. The level of volatility for Engenia alone or the Engenia in the tankmix was extremely low but was not zero. I have seen data as well that would suggest that Xtendimax shows similar level of volatility over that same time frame. Are numbers that low biologically significant? Probably not in small plots like this or possibly in a 20 acre field. I am not as sure when a good number of farmers spray thousands of acres in a single county in a few days. Could even those small amounts build up when sprayed over that many acres and help cause all the drift we are seeing? I don’t know but it is a good question and I am not confident BASF (manufacturer of Engenia) nor Monsanto (manufacturer of Xtendimax) really know. Finally, inversions are another common reason we may be seeing so much dicamba trespassing across the country side. Inversions occur most days in Tennessee during June and July. Just that fact makes it very hard to not accidently spray into an inversion. Of course, if you spray into an inversion tiny drops can get caught in the cooler air and hang up for some time. Moreover, if dicamba is volatilizing out of a field it likely can get caught in the inversion as well. There are many moving parts to this issue and I’m not confident we will ever get to the bottom of it. My best guess is that at some time or another all the reasons mentioned above are a cause. This action is in response to primarily farmer to farmer complaints currently under investigation by TDA of suspected dicamba related damage on cropland. These measures are based on the recommendations of UT Extension and only apply to dicamba products purchased and used for agricultural purposes. The rules are effective immediately through Oct. 1. “Our approach will offer protection to those who stand to be negatively impacted by off-target movement of dicamba while also allowing those farmers who have invested in products designed for their crops to continue to use the appropriate herbicides responsibly,” Agriculture Commissioner Jai Templeton said. Dicamba is a broad-spectrum herbicide. Products containing dicamba have been used for household and commercial weed control for decades. TDA is working to ensure an appropriate and scientifically-grounded response to an increase in complaints of possible dicamba drift. The department has focused staffing and resources to respond to those complaints quickly and efficiently. Furthermore, the department is engaged in daily discussions with producers, the University of Tennessee, manufacturers, other state and federal agencies and ag industry representatives to address this issue. State and federal laws mandate applicators strictly follow label directions and consider the weather and potential for temperature inversions when applying any herbicide. Any suspected misapplication should be reported immediately to TDA at 800-628-2631 or 615-837-5148. The department will take appropriate enforcement action for any misapplication, including but not limited to suspension or revocation of a certificate and state penalties up to $1,500 per violation, in addition to federal penalties and possible criminal prosecution. To assist producers and others who have questions, TDA has developed a dicamba resources webpage with links to educational information, a complete listing of approved dicamba products and the new rules. Charles Orton, of the Deerfield Community, was presented with the Century Farm award at the 2017 Salute to Agriculture Breakfast. 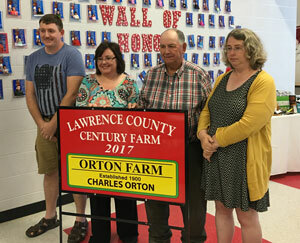 Mr. Orton's farm has been in operation since 1900. Pictured are: Nathan Orton (son), Nancy Garland (daughter), Charles Orton, and Elaine Orton (daughter). The University of Tennessee Institute of Agriculture (UTIA) has received a grant from the U.S. Department of Agriculture to expand the farm financial management database FINBIN to include Tennessee farms, making Tennessee the only Southeastern state currently contributing data. FINBIN is a well-established, publicly available, secure farm financial database that provides benchmark financial information for producers, Extension educators, lenders, and other agricultural professionals. Because Tennessee is agriculturally diverse, the state will be contributing data on enterprises not previously represented, such as cotton, tobacco, a variety of vegetables, hay, meat goat production and more. Furthermore, one of the recommendations in the Governor’s Rural Challenge is to enhance farm net income and cash receipts for the state by improving marketing and production of agricultural products in the state. Thus, the development of benchmarking for farms in Tennessee will be of great interest to state policy makers and could play a key role in gauging the progress of the 10-year strategic plan. Farmers wanting to know more about this project and how they can participate, please contact Chris Boyer at 1-800-345-0561 or cboyer3@utk.edu or contact UT Extension Farm Manage Specialist, Les Humpal at 931-375-5301.